All ornamental metalwork of the Seminoles was made of German silver, or rarely, real silver, At first these items were trade goods, but later these items were made by Indians, many times by beating silver coins together. There were no limits on who could wear these items. They were not indications of wealth or status. Note: many o these items can be made of sheet nickel-silver obtainable from Indian lore suppliers, or use any silver-gray metal. There is no proof of beads being added to gorget thongs, nor were they made of copper. The crescents may be hung on a chain or leather thong. 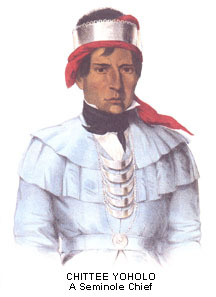 The gorget was worn close to the neck. The were originally neck armor. Shoe buttons should be used in the holes to hold the gorgets. These buttons were originally silver. Gorgets were the last remnants of medieval armor. 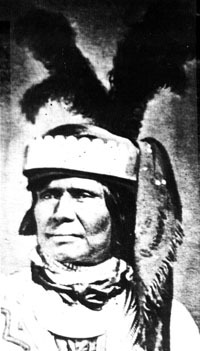 The were used as officer�s insignia, and were given as gifts to important Indian chiefs. The became so popular that they were used as trade goods. 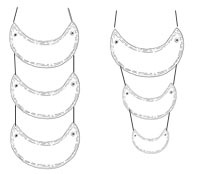 Gorgets are worn in groups of one to four. There is no significance to the number used. However, four were rare. 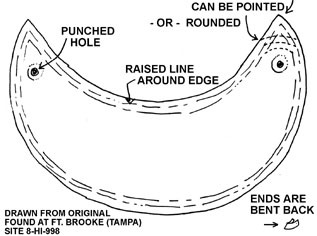 There are no designs on the gorget, they were left plain except for a raised line along the edge. 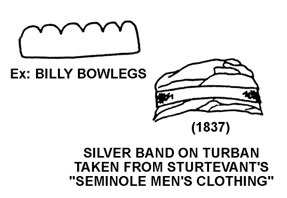 Worn on upper arm or wrist (wristbands only seen in paintings of Osceola). 1 to 1 � inches wide. Tied together with wool and ends left pendant (only when worn on wrist). This can be made from 2 to 3 silver beads (3rd goes on top), silver cone, and wire. Other kinds were made from beaten coins with geometric designs cut in. 1 to 1 � inches wide (can be larger). Some decorated with scalloped top (ex: Billy Bowlegs). Decorated with embossed lines and dots. Designs were raised, not punched through. Some were soldered bands with a �table� soldered on top. Rings may be trade goods. Rings occasionally were made from copper or gold. "Silver Work of the Florida Seminole. ", John Goggin, El Palacio, Vol. 40, No. 2, 1940. "Florida Seminole Silverwork. ", Byron Johnson, Florida Anthropologist, Vol. 29, No. 3, 1976.